I need to change the wiring on Electric clothes dryer from 4 wire to 3 wire plug. original 4 wire was color coded but the 3 wire is not. am i to assume that the middle one is the neutral and the other two can go on either post? Hope you can help me – thanks! When it comes to electrical stuff, I follow this hard and fast rule: NEVER ASSUME ANYTHING! And the truth is that in this modern age of readily available, inexpensive (even after accounting for inflation), and easy-to-use multimeters, you don’t have to! Let’s take a look at your three-wire power cord, like this one ratcheer. 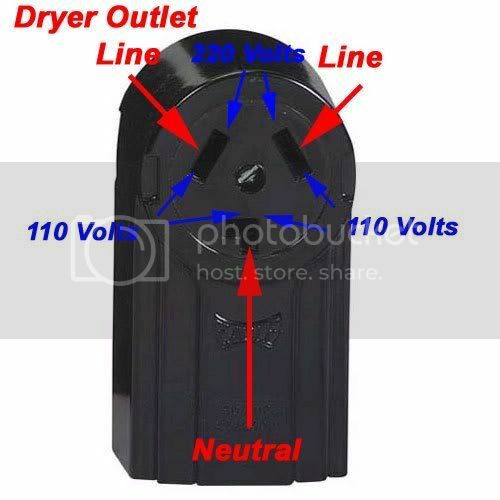 Notice that it has two straight spades set at an angle and the middle spade is L-shaped; this is so that it can only fit into special electric dryer outlets like this one. That L-shaped spade is for the neutral connection and should correspond to the middle conductor. Note that I said “should.” This is where we get to the part about not assuming anything; and we don’t have to ‘cuz it’s easy enough to verify using our multimeter. What’s that you say, you don’t even have a multimeter much less know how to use one? Well, now, that’s a problem that’s easily remedied! Kommen zie hither, bittë, and grok ye on my world-famous quick ‘n eazy guide to making basic electrical measurements. Go on, click it and read it over real quick-like, I’ll wait. Pay particular attention to the part about making continuity measurements ‘cuz that’s where we’re going with all this. See? Was easy, da tovarish? Now, just take your multimeter and set it to measure resistance so we can do a continuity check. With one probe on the L-shaped spade and the other probe on the middle terminal at the other end of the cord, you should read full continuity. If you do, then you’re good to go– you have just verified that the middle wire of the cord is the neutral wire. To learn more sweet mysteries of dryer cord wiring, come hither. And if you need parts, repair manuals, or accessories for your dryer, come git you some! This entry was posted in Dryer Repair on May 6, 2008 by Samurai Appliance Repair Man.